Last Thursday, I had the good fortune of being seated for lunch at a window table in a hotel on Sansom Street in Philadelphia. 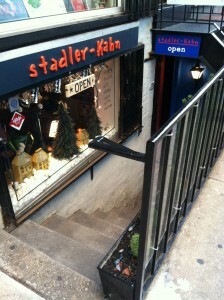 Just to my right and across the street I spied an interesting looking shop called stadler-Kahn. I had no idea that a visit there later that day would score me a new friend, a great vintage bracelet, 3 babysittingKevin t-shirts and a name for myself, should I ever become a geriatric pole dancer. Owner Alex Stadler refers to his downstairs shop as reminiscent of the 5 and Dime stores of his childhood. I found myself doing slow laps around the shop, one loop after another, seeing new and interesting things each time. Yes, this was how I remember navigating the numerous 5 and Dimes I loved as a child too. 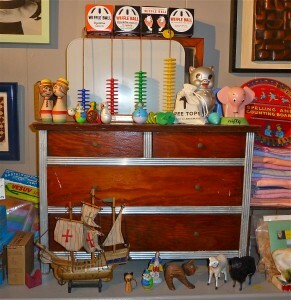 Gifts, clothing, and furniture both vintage and new as well as interesting candies and notions are some of the treasures you will find here. 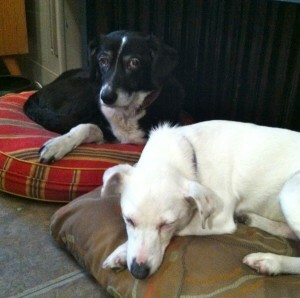 Alex shares his space with his two dogs Riley and Stevie who snuggle up on their beds next to the cast iron radiator. They are friendly and surely make good company for Alex throughout the day. 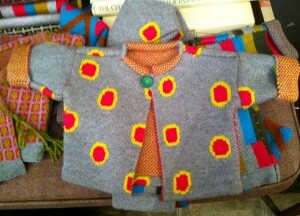 Alex’s fabulous sense of design is echoed in his ability to group just the right things together. 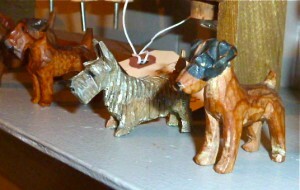 Little vignettes throughout the store give shoppers real life scenarios of how to display treasures ranging from little carved dogs to retro toys or glassware. When entering stadler-Kahn, a great mid century modern piece will surely catch your eye. 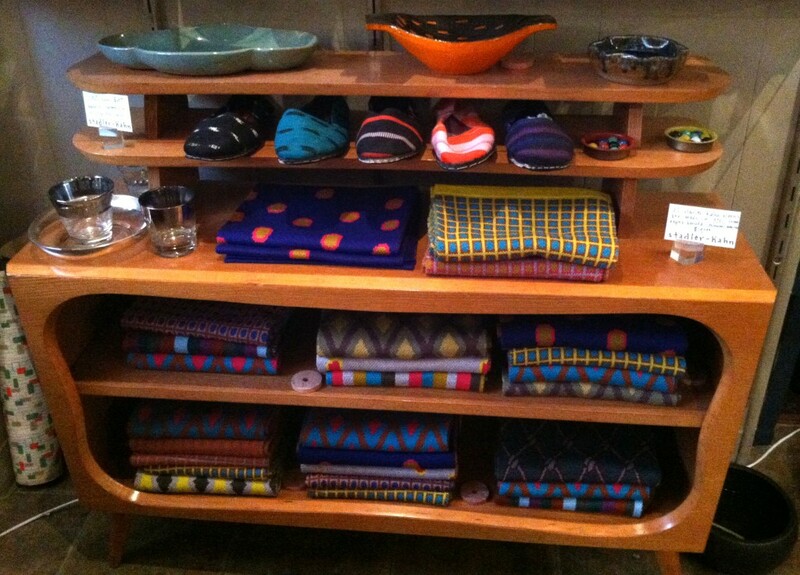 Nestled on its shelves, you’ll find colorful stacks of fine Italian Merino wool scarves designed by Alex himself. 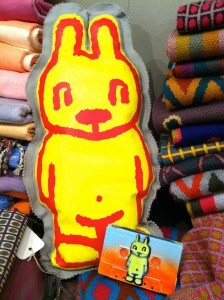 Not far away, you’ll find babysittingKevin, a rabbit character created by Alex who you will see on various items throughout the shop. I couldn’t resist picking up a repurposed cassette tape which had been transformed into a zippered wallet/coin purse with babysittingKevin on the front. All the great things in the shop aside, it is Alex himself that is the true magnet that will keep people coming back again and again or at least me. Over the course of my 4 day stay in Philly, I made it a point to stop in several times to visit. 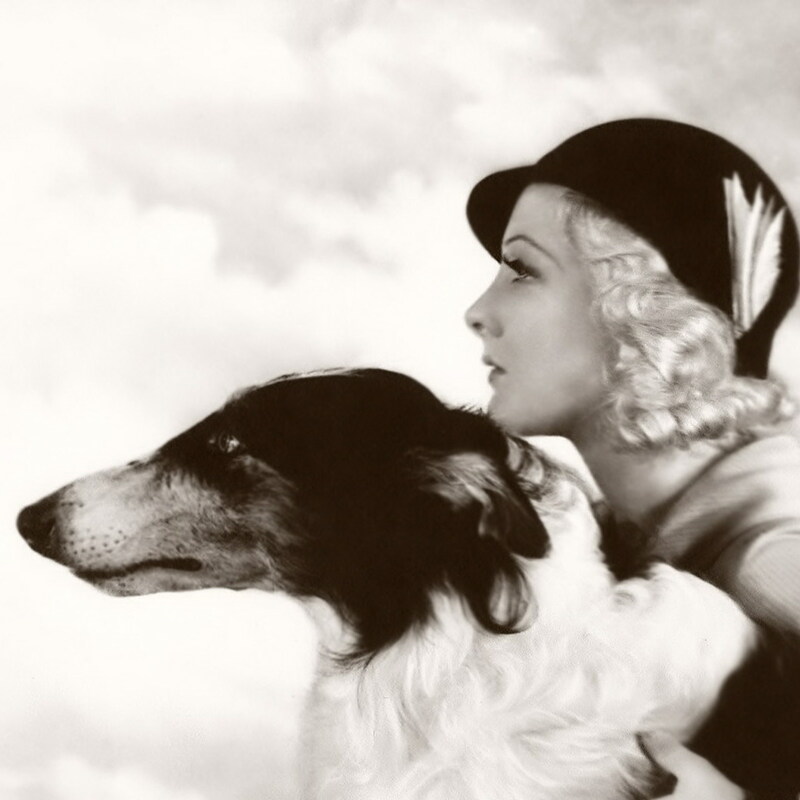 I was always greeted with a smile and the promise of an interesting discussion about everything from real estate to parenting to writing or art. At check out time, I reminded Alex that I would also be taking the bunny cassette. Without missing a beat, he said that Bunny Cassette would make a great stripper name. Another woman browsing in the shop glanced over so I quickly put dibs on the name just in case I follow through with the whole geriatric pole dancing thing. 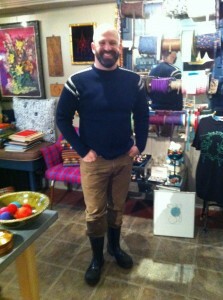 If you are visiting Rittenhouse Square, stop in and see Alex, Riley and Stevie. Be sure to tell them Bunny Cassette sent you. I’m sure he’ll be thrilled at your endorsement Catherine! I will have to go check it out myself. Love the scarves! So glad you enjoyed your visit to Philly. There’s much left to explore! Yes, you should definitely check it out. Love that area of the city. Who knows, maybe you’ll come away with a fantastic stripper name like I did! Sounds like a very interesting shop. Now I need to make a trip to Philly…..love stores like that!